Built in 1883 by Leonard Day, a local flour milling and lumber industry entrepreneur, our building was named after Day and his ownership of the entire city block surrounding it. In the 19th century, it was trendy to name the first building on the block after its owner- our very own vanity license plate, if you will. The entrepreneurial spirit of Day is ingrained in the building and has been from day one. 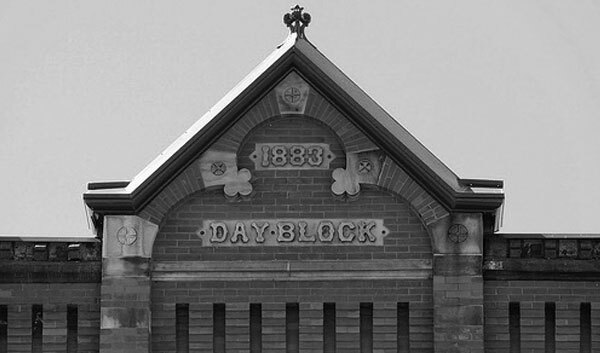 Over the years, Day Block has housed a slew of interesting businesses: a hospital, a furniture store, an undertaker service and a plumbing supply store (also maybe a brothel, but we’re just going by public records here). Day’s innovative spirit is carried on today through our brewery’s owner, Jeff Hahn, who bought the building in 2005 to house his 3rd-floor web and marketing agency, the 2nd floor Day Block Event Center and the computer graveyard in the basement. 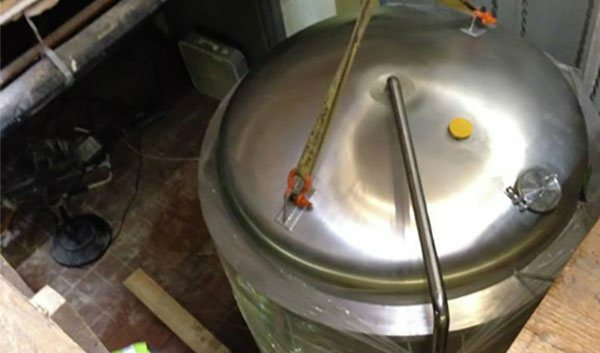 Jeff and his brother, Chris, spent a few years home-brewing on a pilot system, sharing samples with their colleagues on “Beer Fridays.” When the restaurant leasing the first floor failed, the Hahn Brothers took the opportunity to make their dream a reality. They began research on brewpubs and decided to move forward with a brewpub and pizzeria concept. They also opted to hire a (real) brewer. Moving into an older building proved difficult for installing everything that goes into creating a Brew House. All of the equipment had to come in through windows; the tanks in the basement had to be dropped in through a hole in the floor! Watch where you sit! Construction work was completed with the help of the Hahn Brothers, Dan the brewer, Joe the Head Chef, Stephenie the Front of House Manager and the rest of the Day Block staff (again, watch where you sit!). Jeff named the brewery in honor of the people and history which came before them. Blood, sweat, tears (and now beers) have all been spilled in this historic building to make it what it is today. We honor that hard work in everything we do here. Frank’s Red Ale pays tribute to Frank’s Plumbing, which occupied the building for about forty years and our flagship IPA is named after Leonard Day himself. We haven’t come up with any brothel-related names yet, but we’re open to suggestions! We also do whatever we can to honor the city and state that Leonard Day contributed to by continuously working with local farmers and businesses. We’ve invested a lot of time and energy to make this brewpub a reality. We hope that you - our customers, our neighbors and our friends - will continue to invest in good times with us! We appreciate your business. Leonard Day was an entrepreneur and early investor in the flour and lumber milling industries of Minneapolis. He was born May 6, 1811 in Leeds, Androscoggin Co, ME and moved to Minneapolis in 1848. He began his foray into milling by building a sawmill with his brother at the foot of Saint Anthony Falls (St. Paul). Minneapolis was platted in 1854 upon the banks of the Mississippi River at St Anthony Falls. The city’s growth was spurred by its proximity to Fort Snelling and the boom of the flour and lumber milling industries, which utilized the natural hydropower of the river. Leonard Day made his fortune through various milling operations and investments. 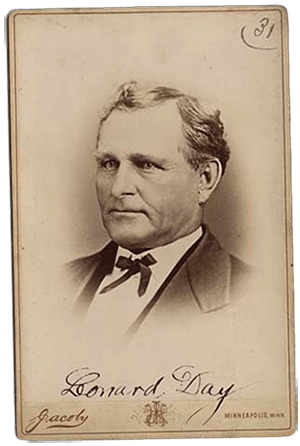 He built his own mill upon the dam owned by the Pioneer Mill Company, which later became known as “The Bassett and the Day mills.” He even owned stock in the Minneapolis Milling Company, which became present day General Mills. The city was officially incorporated in 1867 and in the same year train service between Minneapolis and Chicago was established. The rising population was fueled by the booming flour and lumber milling industries. Leonard Day made a major investment in milling through remodeling the government mill and opening it as a sawmill. He later expanded his milling enterprises by becoming a founding partner of the Zenith Flouring Mill in 1871 and the Palisade Mill in 1872. At the height of production, Minneapolis was the world’s largest producer of flour, which earned it the nickname “The Mill City.” At the time, the city was also home to the largest and most technically advanced flour mill in the world! The Washburn A Mill could churn out enough flour to produce 12 million loaves of bread a day! On the evening of May 2, 1878, the building exploded in a fiery blaze that killed 18 people and leveled many adjacent mills including the Day’s Zenith Flouring Mill. The explosion, caused by the ignition of flour dust, reduced the city’s flour milling capacity by 1/3. The exact reason why Leonard Day built the Day Block building is unknown. He was an entrepreneur and it was thought he had some plan for it before his untimely death during the year of its construction. The building was designed in the Queen Anne Commercial style. Prestige and legacy were very important for the wealthy of that era, hence they often left their mark or name on property they owned. The name Day Block comes from Day’s last name and the fact that he owned the surrounding city block. The upper 2 floors of the Day Block building were used as a hospital between 1884-1885. 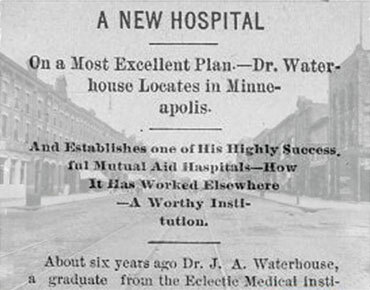 The Michigan and Wisconsin Hospital Co specialized in treating injuries and illnesses of mill workers that resided in the neighborhood. Mill workers were able to receive care through a $10/year health care plan! In 1881, Peter O Melby (a Norwegian Native) arrived in Minneapolis from Ohio. Having been educated in the trade of cabinetmaking, he took on a clerkship with E. Edsten, a furniture maker and undertaker. He maintained employment for six years until 1887 when he had the experience and means to open his own business in the Day Block building. He used the first floor for building furniture and the basement for his undertaking services. The Michigan and Wisconsin Hospital remained in operation on the second and third floors. He operated the business for the next 34 years until his death. Andrew Skoog (A.L.) was a leader of the local Swedish Tabernacle Choir and also maintained a music store in the Day Block building between 1892-1893. He was known as a talented composer and hymn writer who wrote many choruses for local churches. Skoog also published and sold a monthly Swedish musical magazine known as “Gittit” which featured popular selections as well as his own compositions. Leonard R. Day was the son of Leonard Day and was endowed with many opportunities in his life such as an English University education and the means to travel the world. However, he also had a reputation for being wild. 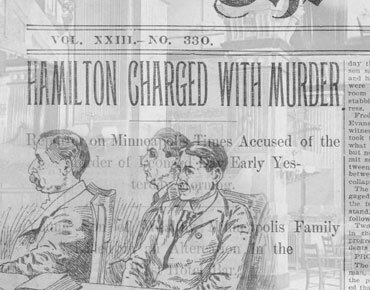 Shortly after 2 AM on a Sunday morning in 1900, a man he had only just met murdered him at the West Hotel in Minneapolis. During the 19th century, Minneapolis’ industrial areas attracted large numbers of madams and many “houses of ill repute” built up quarters near the riverfront-milling district. The city made a compromise to confine the houses to special “red light districts” and fine the madams each month. The last surviving house sits just a stone’s throw from the Day Block building. Ida Dorsey, a madam originally from Kentucky, commissioned the house at 212 Eleventh Ave. S. The location was key because of its proximity to the mills, the railroad, and the alcohol patrol district. After nearly 20 years of fuzzy legality, the city clamped down on prostitution and by 1910 eliminated the red light districts. In 1928, the Washburn Crosby Company merged with 26 area mills in the wake of reductions in flour production. The new company became known as General Mills and refocused its efforts on the production of processed food products such as the Betty Crocker brand. The Oken Brothers was a local grocery supply store that was located in the Day Block building. The brothers, Martin and Naomi, immigrated to Minneapolis just before 1905. The store served residents of the neighborhood and mill workers. 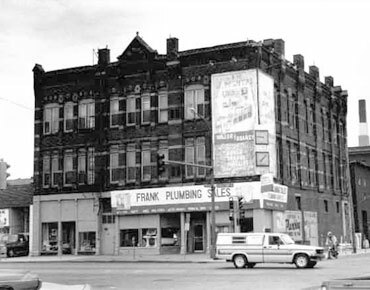 Maurice Frank opened “Franks Plumbing” in 1946 within the Day Block building. The storehouse specialized in hard to find antique and discontinued plumbing parts. For over 60 years the business mainly relied upon word of mouth and the DIY community to sustain itself. It was thought that the store had the largest collection of porcelain tank covers in the US! Jeff Hahn purchased the building in 2005 and began a long restoration process that would preserve the building’s unique nineteenth-century charm. Hahn's web design and internet marketing company, Internet Exposure, moved into the building's third floor in Sep 2006. Restoration work on the second and third floors finished up in early 2007. In 2009, Hahn opened the Day Block event center on the second floor of the building. It quickly became a popular spot for weddings, parties and corporate events in the Downtown Minneapolis area. In 2014, Hahn opened Day Block Brewing Co. located on the ground floor of the building. 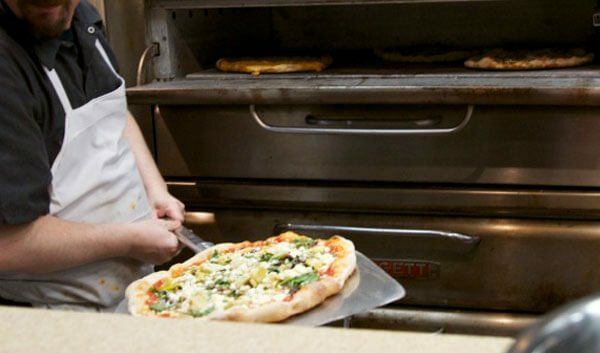 The Downtown East neighborhood brewpub serves up fresh beer and delicious pizzas every day! Our mission is to cook for you; we create our unique, delicious food using the best ingredients available. As much as possible, we source our ingredients from local farmers and producers, using as many organic products as we can. We take pride in cooking from scratch and by hand. Every day we bake bread, pickle all sorts of stuff and ferment our own kimchi and sauerkraut. We make all our own sauces, salad dressings and spice blends. We even wash dishes when we’re done! Thanks for choosing to Invest In Good Times with us!